Footballer of the Year Lee Keegan capped an incredible few months by steering Westport to a memorable AIB All-Ireland Club Intermediate Football Championship success at Croke Park. The All-Star Mayo defender returned to GAA headquarters just months after coming up short of Dublin in the inter-county All-Ireland final and helped his team to a hard fought one-point win. Four Mayo teams lost All-Irelands at GAA Headquarters last year between club and county, including a clean sweep of junior, intermediate and senior club deciders, so this was a particularly sweet win. 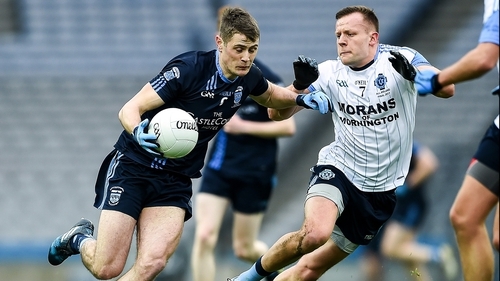 Oisin McLoughlin's two-goal blast proved crucial though Westport were left hanging on for a finish after coughing up a seven-point lead to hold the narrowest of margins at full-time in front of a 9,075 crowd. St Colmcille's still trailed by six points with 57 minutes on the clock but reeled off 1-02 to set up a thrilling finale though Westport held on for a maiden title. Graham Reilly, the new Meath captain, continued his excellent form for Colmcille's and kicked 0-03 overall including the game's opening point after four minutes. But it was one-way traffic for the next 20 minutes or so as Westport took over and opened up a seven-point lead that would go a long way towards securing the win. Shane Scott levelled the game at 0-01 apiece and begun a spree of scoring for the westerners that saw them boot eight points in a row to lead 0-08 to 0-01. Westport's Brian McDermott with Joe Sweeney of St Colmcille's. Free-taker Fionn McDonagh and Colm Moran were also on the mark as Westport opened up with some exciting football and cut the east Meath men apart. Westport lost Kevin Keane, a former All-Ireland finalist with Mayo, to an early injury and their progress was halted by a James Conlon goal in the 28th minute. Reilly set it up with a great run and lay off to the corner-forward though Westport's response was emphatic with a McLoughlin goal 90 seconds later. Colmcille's closed out the half with points from Cathal Hillard and Reilly to trail 1-09 to 1-03 and felt they were still alive and kicking. A strong third quarter then saw them reduce the deficit to just two points following points from Ben Brennan and Reilly before Brennan netted in the 43rd minute. Reilly, again, was the creator though he was also fortunate as his free-kick cannoned off the post for Brennan to claim possession and rifle home from close range. Westport pulled clear again with points from Phil Keegan and Patrick O'Malley and looked to be on the way when McLoughlin netted his and the team's second goal after 52 minutes. He flicked in from close range after a great run and pass from Moran and Westport led 2-12 to 2-6. But the concession of a third goal, a Jack Reynolds penalty conversion for Colmcille's, allied to several bad wides from Westport left just three in it entering the six minutes of stoppage time, 2-12 to 3-6. Colmcille's clawed back further points from Eoin Woods and Brennan but came up just short as Westport clung on. Westport: P O'Malley (0-01, 0-01f); K Dever, K Keane, N McManamon; B McDermott, L Keegan, J Walsh; B O'Malley, S Scott (0-03); F McDonagh (0-03), P Keegan (0-01), L Staunton; C Moran (0-04), P Lambert, O McLoughlin (2-00). Subs: D Horan for Keane, R Geraghty for Staunton, A Dunne for P O'Malley (black card). St Colmcilles: J Brown; A Lynch, C Ward, J McDonnell; E Woods (0-01), I Mullen, J Sweeney; D Sheeran, R McCloskey; C Hillard (0-01), B Brennan (1-02), D O'Byrne; G Reilly (0-03, 0-01f), N Ronan, J Conlon (1-00). Subs: J Reynolds (1-00, 1-00 pen) for D O'Byrne, C O'Byrne for Sweeney, C Kelly (0-01, 0-01f) for Ronan, J Kavanagh for McDonnell, Ronan for Hillard.